Provide comfort for the family of Barbara Fillmore with a meaningful gesture of sympathy. Barbara Ann Fillmore, 84, died Sunday, February 10, 2019 at her home in Garden City. She was born January 24, 1935 in Hill City, Kansas the daughter of Harvey Roscoe & Mary Elizabeth (Law) Brandyberry. Barbara grew up in Hill City where she attended school and graduated from high school. She then attended Kansas State University. On September 1, 1956, she married Keith Lloyd Fillmore in Hill City, Kansas. The lived in Manhattan, Topeka, and Salina before moving to Garden City. Barbara worked as a homemaker until 1988 when she became the owner of Bar K Fabrics in Garden City. She retired in 2015. 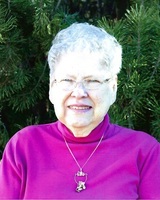 She was a member of the First United Methodist Church, the Pathfinders Sunday School Class, Garden City Iris Society, and a club leader for Beacon Booster 4-H Club. Barbara enjoyed cooking gardening, sewing, making all of her daughter’s wedding dresses, and she especially enjoyed spending time with her grandchildren and great-grandchildren. Survivors include 5 daughters Diane (Bill) Simshauser of Lakin, Kansas, Patty (Chris) Woods of Garden City, Kansas, Paula (Ronnie) Wilson of Jetmore, Kansas, Jennifer (Roger) LaSalle of Garden City, Kansas, & Kimberly (Bob) Moser of Springfield, Virginia; a brother Willis (Elsie) Brandyberry of Hill City, Kansas; 9 grandchildren Chelsea (Wesley) Gleason, Nathan (Jessica) Simshauser, Caleb Woods, Darci Woods, Lee (Alisha) Wehkamp, Matthew Wehkamp, Lindsay Wehkamp, Blake LaSalle, & Tyler LaSalle; and 5 great-grandchildren Lena Gleason, Quaid Gleason, Wyatt Simshauser, Maverick Wehkamp, & Rylee Wehkamp. Barbara is preceded in death by her husband Keith who died on March 11, 1994. She is also preceded in death by her parents and 2 grandsons Jacob Simshauser and Garrett Simshauser. Funeral service will be held at 10:30 a.m. on Thursday, February 14, 2019 at the First United Methodist Church in Garden City with Rev. Joel Plisek officiating. Burial will follow at Valley View Cemetery in Garden City. Friends may call from 9:00 a.m. to 8:00 p.m. on Wednesday and the family will be at Garnand Funeral Home from 7:00 p.m. to 8:00 p.m. on Wednesday to visit with friends. The family suggests memorials given to the First United Methodist Church in care of Garnand Funeral Home of Garden City. To plant a memorial tree in honor of Barbara Ann Fillmore, please visit our Heartfelt Sympathies Store. Such a special lady. Helped me many times with sewing projects. She will be missed.